Tombstone, Arizona is known worldwide for its colorful history that depicts the essence of the Old West. Preserved today is the same dusty street and buildings that stood in the 1880s at the beginnings of the great mining exploration in the Southwest US. Watch several videos taken in Tombstone, including a demonstration of the annual Helldorado Day's gunfight and tour of the infamous Boothill cemetary. Helldorado Days are held every third weekend in October with gunfight re-enactment shows, street entertainment, fashion shows and a family oriented carnival. Watch a video of a Helldorado Days gunfight demonstration on the streets of Tombstone. 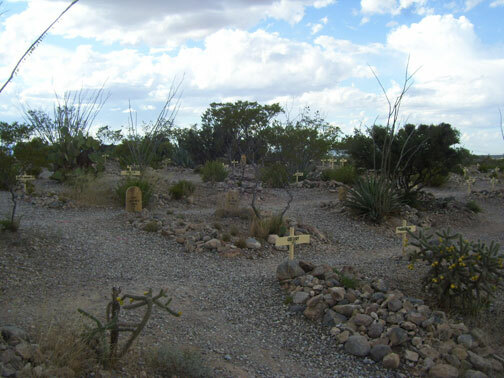 The Boot Hill Cemetary holds over 300 people, including the infamous Billy Clanton, Frank McLaury and Tom McLaury- the three men killed in the Gunfight at O.K. Corral. Watch a video of the Boothill Cemetary. Watch and download free classic Western movies. Photo Above: Boot Hill Cemetary in Tombstone, Arizona. Left: O.K. Corral behind EMOL.org publisher Robert Zucker.